Bandito Espresso is all about good food and even better coffee. We are convinced that organic and fair trade products really make a difference, both from a quality and an ethical perspective. That is why 99% of our products are certified organic and fair trade where possible. 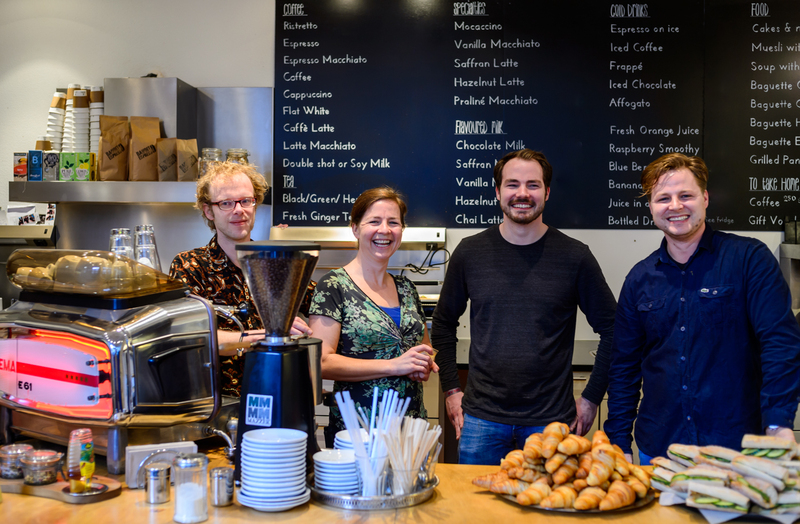 Bandito Espresso is run by the four owners and a team of passionate baristas & foodies. Inspired by our friends from Passenger Espresso in Berlin we founded Bandito Espresso in 2010. We hunted down vintage espresso machines, built our own mobile espresso cart and started working from the weekly market in Maastricht. In 2011 we opened our bar in the city centre at the Faculty of Arts & Science. In 2012 we started working from Randwyck as well. Every day we work hard to provide you with the best coffee and food in town. All our products are a vegetarian and vegan where possible. We are most famous for our coffee but also for our home made carrot cake, hummus and cookies. Every day we prepare a fresh soup, stuffed with as many veggies as possible and suitable for vegans and people with a gluten intolerance. Visit us to find out about the daily specials on our counter like cakes and salads. Do you have special requests or suggestions? Let us know. During our opening hours we prefer to focus all our attention towards our guests. That is why we ask you to contact us via email, we have no contact phone number. © 2019 Bandito Espresso | Organic and fairtrade coffee specialities.